Can Supersmile remove stains on dental bonding? Does the Supersmile accelerating kit work on bonded teeth? How long does it take for Supersmile toothpaste take to remove stains? Let’s take your easier second question first—Supersmile toothpaste will remove surface stains on teeth with the first use. It has an ingredient, Calprox, that enzymatically dissolves the protein pellicle layer that covers your teeth, and stains will attach themselves to that pellicle. If the pellicle is removed, the stain is removed. When a hygienist cleans your teeth with a pumice abrasive, she is removing that pellicle, and that is what gives your teeth that super clean feeling. The first question is a little more involved and requires making a couple of points. First, you reference the Supersmile Accelerating Kit. 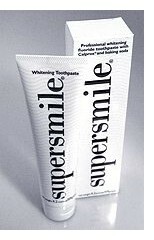 This adds a whitening accelerator to the Supersmile toothpaste. It doesn’t improve its stain removal power, but it adds a whitening effect with peroxide to try to actually whiten the teeth. So if your concern is surface stains, I would stick with the less expensive regular Supersmile toothpaste. Second, there are a number of possible ways dental bonding could stain, if that’s what you’re asking about. If the bonding is polished and the stain is on the surface, yes, Supersmile should remove those stains. On the other hand, if the bonding has lost its polish, that will make it attract stains and Supersmile won’t restore that polish. This is the reason I always recommended Supersmile for all my bonding patients, because many brands of toothpaste are too abrasive for dental bonding and will damage the polish. Supersmile, on the other hand, in spite of its powerful stain-fighting power, has very low abrasivity and will protect the surface of the bonding or porcelain veneers, or any other dental work. So if that is your case, I would have a qualified cosmetic dentist re-polish your bonding and then you can switch to Supersmile toothpaste to maintain that polish. One more possibility for dental bonding being stained, and that is that it can absorb stain into the actual substance of the bonding. There is no way to remove that stain, and fixing this will require replacing, or at least re-surfacing the bonding with new material. What is this mysterious brown stain on my teeth? I appreciate your help. Last year I began getting mysterious brown staining on my teeth that my dentist cannot remove. He did not tell me it could be fluoride. A natural health practitioner told me it is from excess fluoride. I am 63 years old. I have not used fluoride toothpaste in years, but my township has fluoride added to the water. I have been drinking Poland Spring water which also has fluoride. I do not drink wine or coffee. Last year I started drinking a cup or two of green tea daily which I just found out has plenty of fluoride, so this must be what pushed me to fluoride overload and brown staining. I only drink plain water now. Do you know which bottled water brands do not contain fluoride? Which type of whole house water filtration system removes fluoride? Which cosmetic dentists in New York City would you recommend for bonding? I have had some previous bonding in NJ and was not happy with the color matching. 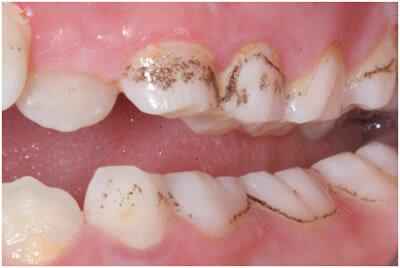 Dental fluorosis is a mottling of the enamel caused by excessive intake of fluoride while teeth are forming. In its mild form it is manifest by white spots. When it is more severe the spotting or mottling can be brown. Once your teeth are formed, they will not be stained by fluoride. So if this is a stain that is new, it has nothing to do with fluoride. I’m a little puzzled by your statement that this is a stain that your dentist can’t remove. Once your teeth are fully formed, any stain that they pick up should be able to be removed. Let me explain the two different ways to do this, depending on the stain. There are only two types of stain that you would be getting on your teeth at age 63. One type would be external staining – something that attaches itself to the surface of your teeth. Any stain of this character should be able to be polished off. Supersmile toothpaste also works very well for removing these types of stains. It enzymatically removes the protein pellicle on your teeth, and it is that pellicle to which the stains adhere. The other type of stain would be internal staining. Your teeth can absorb pigments from food and drinks. Tea is an excellent source of this stain, and, from the clues you are giving me, that seems to be the top candidate for this stain. I would know better if I could see it myself. Internal stains get absorbed into the enamel of the teeth and can only be removed with bleaching. Internal staining would be manifested by a general darkening of the color of the teeth. External staining would probably concentrate around the gumline of the tooth and the spaces between the teeth and would be irregular in appearance. Internal staining would be evenly distributed throughout. I would not recommend bonding for this type of staining, if that’s what you have. Bleaching works better, is much less expensive, and doesn’t require anything artificial to be attached to your teeth, so it will look nice perpetually. Bonding would also require an expert cosmetic dentist, which limits you to about 1-2% of dentists. Any of the expert cosmetic dentists we recommend on our site would do an excellent job with bonding. But you don’t need an expert cosmetic dentist for bleaching – many dentists can do that well. If you do need bonding work, however, and you are in New Jersey, you shouldn’t need to go to New York. 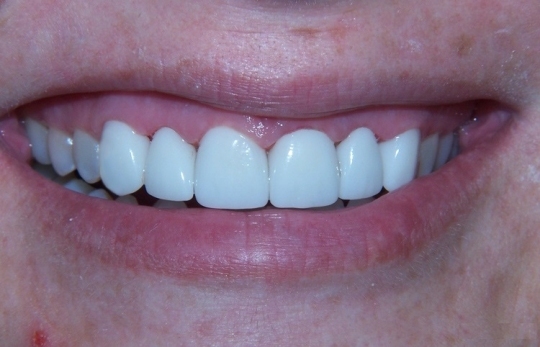 Dr. Allyson Hurley, in Bedminster, does a fine job with bonding. She is AACD accredited. Google her and you will find her website. Dr. Jeff Golub-Evans, in Manhattan, is internationally renowned for his bonding skills, and sees many fashion models and movie stars, if you need that level of care. My son has brown fluoride stains on his front teeth. We have had a local dentist bleach his teeth but the stains are still evident. She recommends veneers but I wonder what the difference in cost is between bonding and veneers? Also can you recommend a cosmetic dentist in Amarillo, TX. Amarillo is the closest city to our small hometown. Don’t have the dentist who did the bleaching do the veneers or the bonding. She doesn’t sound like she knows what she is doing. It sounds like you have figured that out. Teeth bleaching doesn’t work for splotched teeth. I shake my head every time I hear one of these stories, that another dentist doesn’t know how to do this. Depending on the extent of the stains (these fluoride stains are called fluorosis), yes, direct dental bonding may be the best thing – this would cover up the stains. And thank you for asking for our recommendation. But even Amarillo is a problem. I just looked there again and can’t find anyone I would recommend. And, as I check a map, I see that you are clear out in a remote rural area of the Texas panhandle. I know it’s going to be a 4-5 hour trip, but if you want this done right, I would really suggest you go to Oklahoma City. Very few dentists are going to know how to do this right, and they tend to gravitate to larger cities. In Texas, they go to Dallas, Austin, San Antonio, Houston, and other parts of east and central texas. I have looked in West Texas and only last month did I finally find someone in Lubbock that I would refer patients to. And we can’t yet find anyone in Amarillo. Dental bonding is an art. It has to be done freehand, and they simply don’t teach it in dental school. And dentists have to be passionate about appearance-related dentistry to know how to do it well and to stock the materials on hand to be able to do it right. I would recommend Dr. Michael Forth in Edmond, OK. That’s a northern suburb of Oklahoma City. He does beautiful work. Read more about stained teeth. Staining from PerioPlus Periodontal mouth rinse. I had to do a little research for this one, because I haven’t heard of this product before. And I confirmed my suspicions. They downplay it and don’t even mention it on the product label, but this product contains chlorhexidine. They call the label a “nutritional” label, and since chlorhexidine is an antibacterial agent and not a nutritional ingredient, I guess that makes it so they don’t have to disclose that. This is not to be too critical – it’s just that I think they should mention that on the label. Chlorhexidine is an excellent anti-bacterial agent, and has been prescribed by periodontists and general dentists for years as Peridex. I had occasion to prescribe it a number of times. It attaches to the soft tissue and protein pellicle on the teeth and has a long-lasting antibacterial activity that very effectively fights gum infection and inflammation. But it has a nasty side-effect, which is brown staining on the teeth and dental work. That may be why they’re a little timid about admitting this. There is an easy solution, and that is Supersmile toothpaste. Supersmile has an enzyme – calprox – that dissolves away the protein pellicle and as far as I am aware, is one of only two ways to eliminate and prevent this stain. An aggressive pumice polishing of the teeth by a dental hygienist, or Supersmile toothpaste – those are the two ways to deal with this stain. Whenever I gave a prescription of chlorhexidine rinse, I insisted that the patient purchase Supersmile, because that brown stain can become positively ugly. You can buy Supersmile directly from the manufacturer (Robell products in New York City). Or we offer it for a discount on our website. We’ve dropped the price to where we just cover our costs, because it is such a unique toothpaste with unique benefits. It does get rid of this stain, when used on a daily basis, and it is also great for maintaining cosmetic dental work. I have tetracycline stains and 20-year-old porcelain veneers. I have porcelain veneers that have been on 20 years, just about the life expectancy that my dentist told me. I have noticed some changes in the past 6 months to a year. There seems to be more of a gap between the veneers where I am constantly catching whatever I eat. Also, it looks like I have a space developing between the top of the veneer and the gum line. Can these veneers be removed for new ones? My teeth were badly stained by tetracycline. I had tooth bonding done before all the great whitening treatments that are readily available today. I would have preferred that, although my dentist told me that the whitening treatments don’t really work on the type of staining I had. So … can you let me know what the best route of refurbishing my old veneers would be. THX! Porcelain veneers can be touched up. They can be polished and the margins smoothed off. But from what you’re telling me, it sounds like you may need a new set. You say you have a space developing between the top of the veneer and the gumline. In other words, your gums are receding a little and exposing some of the tooth. And if you have tetracycline staining, this may be noticeable, depending on where your lip falls. Teeth bleaching simply doesn’t work well for tetracycline staining. That stain is very stubborn, and even if you lighten the teeth, they never become sparkling and vital the way you would like. But you absolutely need one of the best cosmetic dentists for replacing these veneers. I have heard stories like yours and they have the old bonding or old veneers replaced, and they look terrible. We have a number of New Jersey cosmetic dentists we recommend all over the state. I would strongly recommend that you consult with one of them. Only a small percentage of dentists who advertise that they do cosmetic dentistry have the skills necessary to produce a beautiful smile on top of tetracycline stains. And even though the life expectancy of your porcelain veneers seems to be what your dentist predicted, there is a lot of variability in that life expectancy. From what you’re telling me, the problems you are having are from changes in your teeth, not from a deterioration of the veneers. They might last quite a bit longer if it weren’t for that. Read more about how long porcelain veneers last.